So my sister has a twin....kinda. They met in Kindergarten and were BFF instantly. They looked alike, talked alike, dressed alike, had the same hair cut. You get the point. When Kat moved away we saw her several years later. She and my sister still had the same hair cut and were wearing the same jacket (in different colors) Keep in mind this was pre internet days so they weren't chatting every night. They just had super twin powers of liking the same things. Oh look at me the odd one out. We lost touch again, but thanks to the power of the internet we have been in contact for the last few years. A couple of weeks ago we took a trip to visit her. 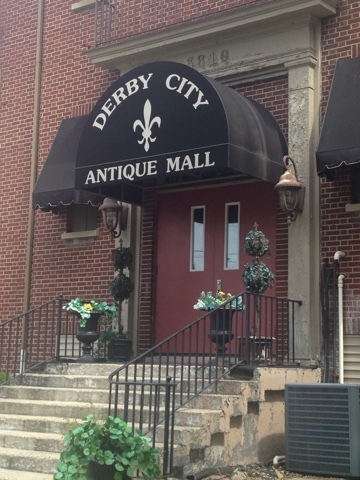 While there, she took us to a super cool antique store (If you're ever in Louisville you should stop in.) 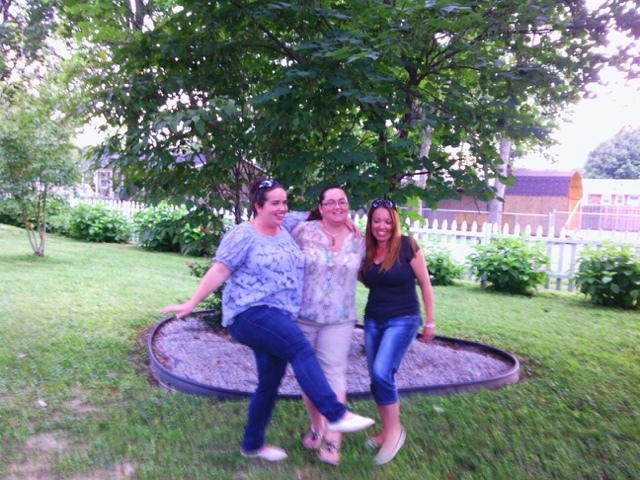 I was so happy Kat humored me by taking ridiculous pics of me. Having a sister's twin is the best. Sorry about the crappy quality everything was taken on my iphone in pretty bad lighting. 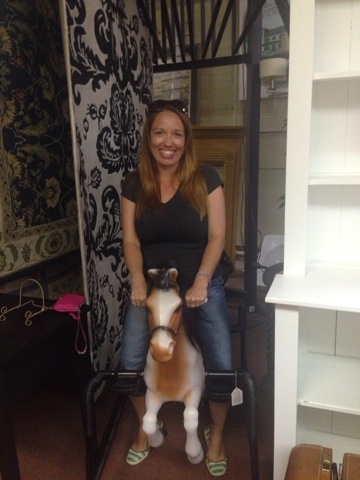 I really should have bought a wooden horse welcome sign. I wanted to paint it orange and blue and put an 18 on the horse. I talked myself out of it and regretted it every since. I will be in Louisville twice for band competitions I think I need to stop in and pick it up. Anyway on to the pics. I think I need this it screams wicked witch from Wizard of Oz. It being the horse capital of the world I thought I needed a horse. Since Emmy is allergic to real ones this will have to do. I bet we win the triple crown. What?!? 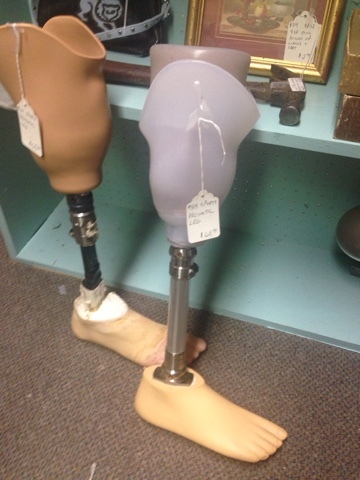 Who buys prosthetic limbs at an antique store, and is it weird I wanted it? 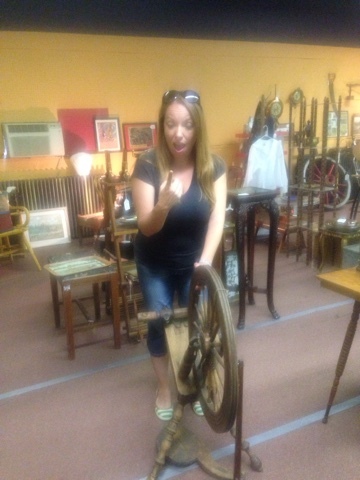 I found a spinning wheel and in true princess fashion I pricked my finger. And fell asleep for 100 years. If you are in Louisville her fiancee is a super awesome chef. She may even share her Green Apple Smirnoff with you like she did me. 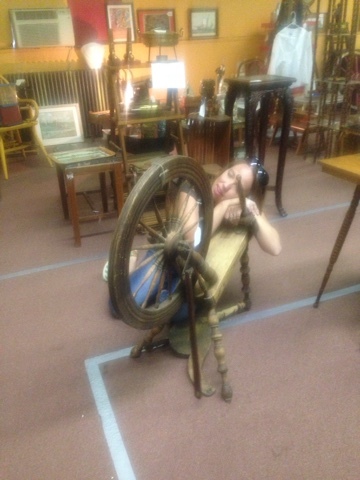 See having a twin sister ROCKS and so does visiting antique stores. 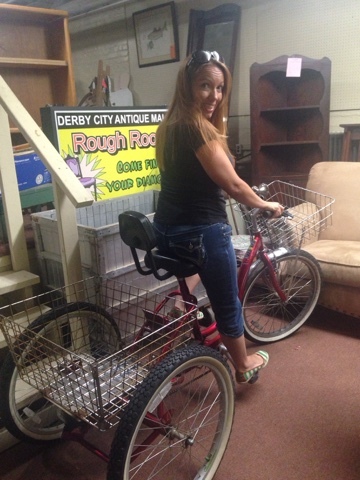 You never know the fun things you can find to play with.